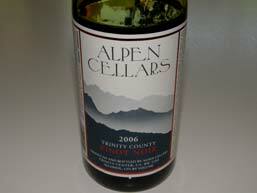 Located in a small valley beneath the rugged Trinity Alps of Trinity County in Northern California. The climate here features warm summer days with cool mountain nights and is an ideal microclimate for early maturing vinifera grapes such as Riesling, Gewüztraminer, Chardonnay and Pinot Noir, the four varieties to which the ranch vineyard is planted. This is a small family operation established in 1984. The winery is open for tours, tasting and retail sales - check the website for hours and directions.